Full uncut version. British director Leslie Megahey here dares to be different to such a degree that the odd outbreak of perfunctory or off-target acting matters not one jot. He has successfully created a distinctive other world, specifically a medieval France which is defined by upper-class corruption, peasant superstition and ecclesiastical apathy. 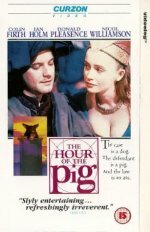 This ludicrous mixture of dark comedy and original thrills is revealed through the story of a smart Paris lawyer (Colin Firth) his practice established in the provinces who has to defend a pig on a charge of murder. Though sometimes creaking under the burden of its own ideas, the film is nonetheless invigorating, intelligent and wonderfully dotty.